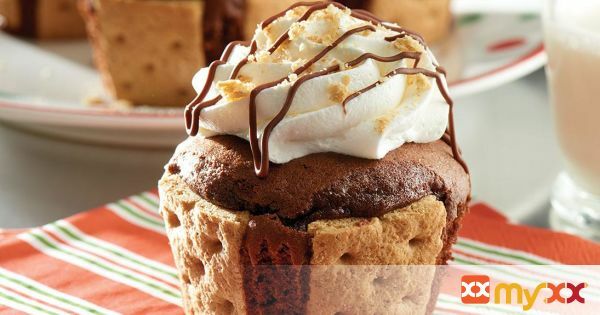 S'more cupcakes- graham crackers and chocolate cake make up the bas and marshmallow fluff, cream cheese and cool whip make up the icing! Delicious! 2. Use serrated knife to cut each of 15 grahams into 4 rectangles; cut each rectangle crosswise in half. Place 1 graham piece in each of 24 paper-lined muffin cups. Stand 4 of the remaining graham pieces around side of each prepared muffin cup. 3. Prepare cake batter as directed on package; spoon into prepared muffin cups. 4. Bake 18 to 20 min or until toothpick inserted in centers comes out clean. Cool completely. 5. Beat cream cheese and marshmallow creme in medium bowl with mixer until blended. Gently stir in whipped topping; spoon into pastry bag fitted with decorating tip. Insert tip into top of each cupcake, then use to pipe cream cheese mixture into centers of cupcakes. Pipe remaining cream cheese mixture onto tops of cupcakes. 6. Microwave chocolate in microwaveable bowl on HIGH 1 min. or until completely melted, stirring every 30 sec. Crush remaining whole graham finely; sprinkle over cupcakes. Drizzle with melted chocolate.